The World Health Organization has published their weekly SitRep (a day earlier than usual), in the form of a 13-page PDF file, which you can download at the link below. The second meeting of the Emergency Committee was convened by the Director-General under the International Health Regulations (2005) on 8 March 2016. 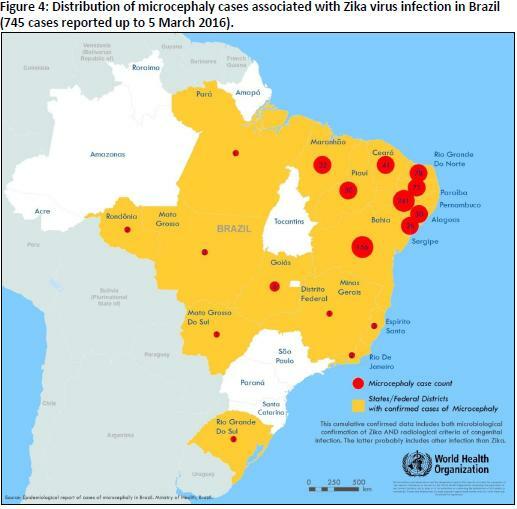 The Committee advised that the clusters of microcephaly cases and other neurological disorders in some areas affected by Zika virus continue to constitute a Public Health Emergency of International Concern, and that there is increasing evidence that there is a causal relationship with Zika virus. Between 1 January 2007 and 9 March 2016, a total of 52 countries and territories have reported autochthonous (local) transmission or indication of transmission of Zika virus (41 since 1 January 2015). The Philippines is the latest to report autochthonous transmission of Zika virus. Five of these countries and territories reported a Zika virus outbreak that is now over. In addition, three countries have reported locally acquired infection in the absence of any known mosquito vectors, probably through sexual transmission. The geographical distribution of Zika virus has steadily widened since the virus was first detected in the Americas in 2014. Autochthonous Zika virus transmission has been reported in 31 countries and territories of this region. So far an increase in microcephaly and other neonatal malformations has only been reported in Brazil and French Polynesia, although two cases linked to a stay in Brazil were detected in the United States of America and Slovenia. Reported cases of microcephaly and/or congenital malformation in Colombia are under investigation. In the context of Zika virus circulation, nine countries or territories have reported an increased incidence of Guillain-Barré syndrome (GBS) and/or laboratory confirmation of a Zika virus infection among GBS cases. A recently published cohort study in Brazil shows an increased risk of microcephaly and other congenital abnormalities associated with a Zika virus infection during pregnancy and provides further information to support the possible causal relationship between Zika virus and microcephaly and other congenital abnormalities. The global prevention and control strategy launched by WHO as a Strategic Response Framework encompasses surveillance, response activities and research, and this situation report is organized under those headings.